Further to yesterday's post about wildlife safety please look @ this attack by a sea lion on a young girl – an unsuspecting tourist who along with her family was enjoying the shores of British Columbia when the sea lion suddenly attacked. Full disclosure: For over twenty years I have waded into alligator infested waters looking for golf balls – actually to describe this with more exact precision my golf ball retriever has gone into the water while I stood on the bank & that is dangerous enough. 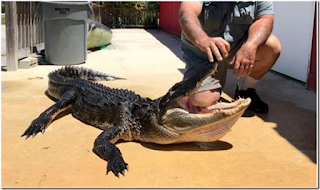 The above photo shows the alligator that attacked 10 year old Juliana Ossa earlier this month while the girl was sitting in one foot of water @ Mary Jane Lake in Florida, about 26 miles from Disney World, where a two year old boy had been killed by an alligator last June in a similar attack in shallow water. When the alligator grabbed Juliana's left leg she somehow remembered the survival strategy she learned @ the Gatorland wildlife preserve, a.k.a. the "Alligator Capital of the World." Juliana's account: "I used what they taught me at Gatorland, so I put my two fingers up its nostrils & it couldn't breathe & had to breathe from its mouth & then let my leg out. The gator didn't do anything because he was too busy biting my leg & too busy with his claws in the sand. He didn't have any attack moves to take out my fingers." The young girl miraculously survived the attack with relatively minor lacerations & puncture wounds & the alligator was euthanized. It has been over two years since I went golf ball fishing with my retriever so I had abandoned the practice long before either of the above two notorious alligator attacks in Florida. I present this safety tip as a example to people going on vacation or just family trips or outings where wildlife, not just alligators, that is strange to them live. When you go on vacation the object is to have fun – but part of the fun is knowing you are safe. "And now I would appeal with confidence to men of all schools, who prefer truth, justice, & the public good to their own systems. Economists! Like you, I am the advocate of LIBERTY; & if I succeed in shaking some of these premises which sadden your generous hearts, perhaps you will see in this an additional incentive to love & to serve our sacred cause." Frederic Bastiat – "To The Youth Of France," Economic Harmonies, page 14. The hiring of college graduates was expected to pick up this graduating class except employers found that one-third of all applicants are unqualified for the positions sought – source iCIMS survey of 400 employers & 400 college students. 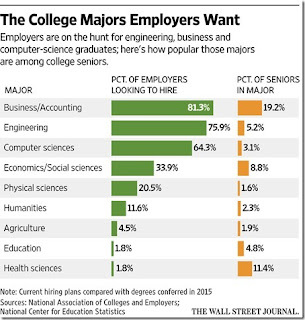 The graph below reveals that many college majors of the 2017 graduating class are not the ones in demand by employers. 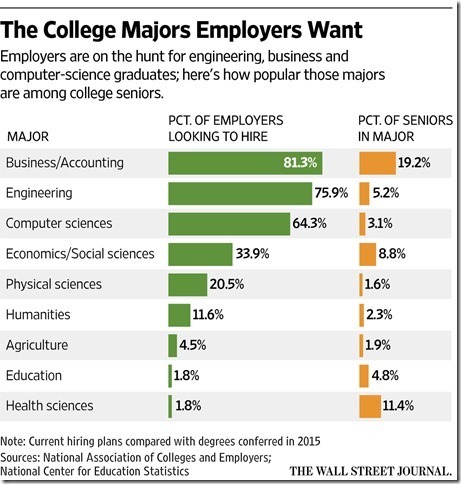 For instance, 75.9% of employers are looking for engineering majors but only 5.2% of seniors majored in engineering – check the mismatches on the graph below & part of the employment problem for many of America's millennials (people born between 1980 & 2000) becomes obvious. Starting salaries are $65,232 for software developers & $63,036 for engineers – source the Hay Group – so those with technical professional degrees have turned the neat trick of being 22 years old & having the credentials to have someone who did not know them just a few months ago pay them over $63,000 per year plus benefits to start. A neat trick indeed. But there are other surveys that confirm the above iCIMS results – Accenture PLC surveyed 1,000 college seniors & found only 15% had received a job offer before graduating. There are headwinds & opportunities for the class of 2017. 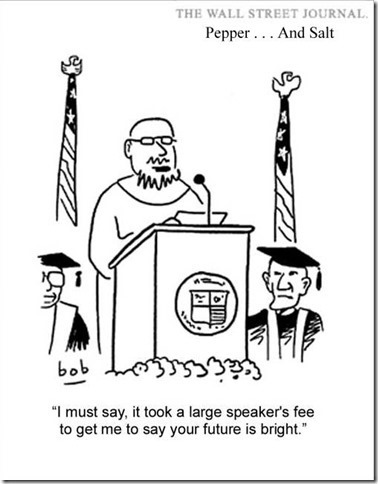 With regard to liberal arts universities the recent trend has been for them to focus more on teaching how to earn a living rather than teach to enlightenment – what with the realization that the average debt for students in the class of 2016 is over $37,000 & 43% of all those with federal student loans are in arrears. See graph below. 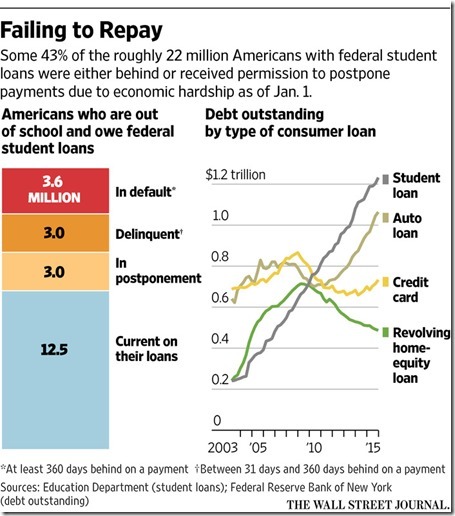 The footnotes on the above graph explains what it means to be in default or delinquent regarding student loans. The category "in postponement" refers to three million people who owe almost $110 billion in student loans who have been given permission to halt payments, if any were even being made, due to a financial emergency such as unemployment. 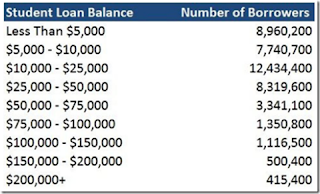 So to summarize & update the figures from the above graphs & tables, there are 44.2 million student loan borrowers whose debt totals $1.44 trillion most of which is held by the federal government – student loan debt is second in size only behind home mortgage debt & is $620 billion more than total U.S. credit card debt. The average student loan borrower, aged 20 to 30, repays $351 per month with the median amount of the same cohort paying $203 per month. Quite a load. 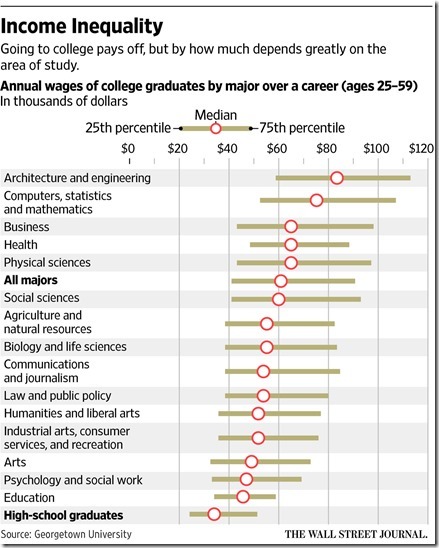 But none of this is to say that a college degree is not beneficial – see graph below that shows the choice of college major dominates financial success in life as we also saw hereinbefore by the starting salaries of software developers & engineers. 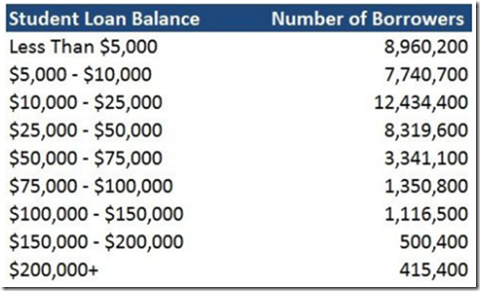 It is the millennial generation that is hardest hit with large student loans & the fact that what these loans are buying just isn't worth it in a great many cases. Millennials currently make up about 40% of the unemployed in the U.S. & in three short years will approximate 46% of all workers. 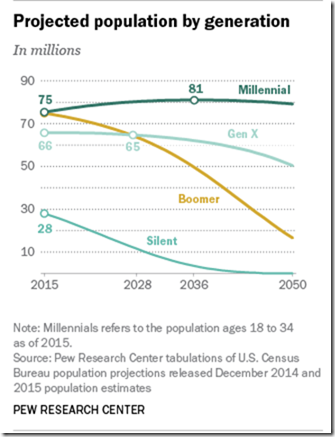 See graph below that shows the population trends for the next 33 years. The average millennial who is employed is receiving lower compensation than previous generations did @ the same point in their work careers meaning that, until now, instead of getting married, buying a home, & starting a family millennials have struggled to pay off student loan debt, all of which has acted as a drag on the economy. The government's headline unemployment rate, U3, @ 4.4% in April equals the low point recorded in the last economic expansion but U6 @ 8.6% in April is still elevated above the pre BO low of 7.9% so there is a way to go before help arrives for millennials still in U6 – i.e., those included in U3, plus all persons marginally attached to the labor force, plus the total employed part time for economic reasons. But there are many factors that influence an economy & how young people initially fit into it – although the problem of college graduates not being totally prepared to step in & participate & contribute to the prosperity of America gets millennials off to a bad start. Other factors that can complicate anyone getting started include 1) the stage of the business cycle, 2) the level of business investment in technology, 3) the aging of the work force, 4) the amount of government regulations impeding businesses, 5) tax law uncertainty, 6) the health of our global trading partners, 7) productivity trends, & 8) in the case of millennials the added disadvantage of trying to break into a mixed economy that is more than half socialist. This post has shown the headwinds that the class of 2017, & in particular millennials, face in trying to find their place in the world. 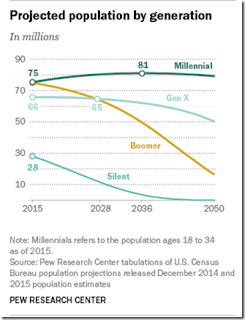 To find the opportunities that are available I recommend millennials check in with the American Council Of Trustees & Alumni (ACTA) & specifically click on their website What Will They Learn? – a report of 1,110 public & private universities that shows each school's annual tuition & also grades the school as to what the students will learn. ACTA has previously worked with many universities to upgrade their programs – like the University of Georgia program which once was graded very low & now is graded "A." Only 25 of the 1,110 schools are graded "A" by ACTA – the complete profile is A 25 (2.3%). B 355 (31.9%). C 351 (31.6%). D 261 (23.5%). F 118 (10.6%). Click here to see the list of "A" schools. The "F" list includes UCLA, Brown University, Johns Hopkins, Bowdoin, Oberlin, & University of California – both Berkeley & Davis. ACTA found that English majors @ Wesleyan University & Amherst College, both with tuition just under $50,000 per year, could receive their degrees without ever hearing the name William Shakespeare mentioned in class & that George Washington University, with tuition just over $50,000 per year, just dropped its American history requirement for students majoring in history meaning that these graduates could possibly never hear the name of the Father Of Our Country or namesake of their university in class. 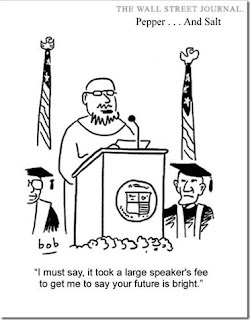 The average tuition @ "F" list schools is 43.2% higher than the average tuition @ "A" list schools. ACTA found that students @ the University of Colorado-Boulder can fulfill the "United States Context" requirement by taking a course entitled "Horror Films & Humanities Culture;" @ UCLA, students can fulfill the "Arts & Humanities" requirement with "Aliens, Psychics, & Ghosts;" @ Western Illinois University, courses such as "Food & Culture" & "Global Social Networks" can stand in for foreign language proficiency. So is it any wonder that over 70% of employers feel that today's graduates are not well-prepared in skills such as "written communications," "working with numbers/statistics," & "critical/analytical thinking." What employer would hire someone for a college level job who could not clearly demonstrate such basic good business-like qualities during an interview? Put another way – employers would ask themselves why would I hire someone who was foolish enough to pay $200,000 for the naïve education on display during the interview. The way forward is really the same as it always has been: Pick a major you can make a living in, select a school where employers come to campus to interview graduating seniors to make job offers, & make sure you are not only well grounded in your major but also @ least six of the following core subjects - Composition, Literature, U.S. History or Government, Economics, Intermediate-level Foreign Language, Mathematics, & Natural Science. Isn't this really common sense – & the way it used to be automatically? There was a time, my time, when you could work your way through college by paying for it with the wages from a summer job. 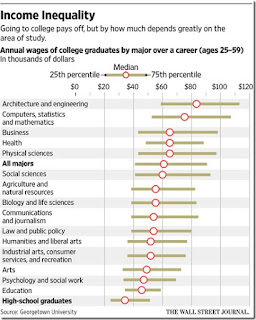 Now very few graduates from the big name schools initially make enough money annually equal to the cost of one year's tuition. Shouldn't this have been telling us something a long time ago? – ACTA's website has been available, & featured on this blog, for years. But my study of the trouble with higher education in America revealed that it is the secondary schools that are the root problem. I have suggested to college administrators to offer a no credit remedial course in civics & American history to enlighten students so that they are not an embarrassment to themselves & the university they attend. In this regard the Texas House has passed House Bill 1776 that would require Texas public high school students, in order to graduate, to pass the same test (i.e., the U.S. Citizenship & Immigration Services test) that immigrants must pass in order to gain citizenship. It is not just civics & American history where the secondary schools have fallen down. Companies like United Technology report that it cannot hire knowledgeable mechanics who know how to put together jet engines, industrial size fan blades, & other sophisticated things that make up high-value manufacturing jobs that Trump wants to keep in America. These positions can be filled by high school graduates who can read a blueprint, measure, & do basic math – but that completes the circle getting us back to education, not just civics & American history. Many of today's jobs, both manufacturing & professional, won't be here 20 years from now. It is only through a top notch education, like Bastiat advocated above, that is constantly being updated & upgraded through additional study & accomplishment (i.e., making & keeping yourself valuable in making a living) that prepares Americans for whatever lies ahead. Posts like this one expose the colleges & universities that take millennials & their parent's money for a ride that results in a worthless degree & large student loan debt; but also shows how & where to look for the opportunities that have always made Americans ready for anything. Long time readers of RTE are quite familiar with the annual event known as Tax Freedom Day - the day when the nation as a whole has earned enough money to pay its total tax bill for the year. 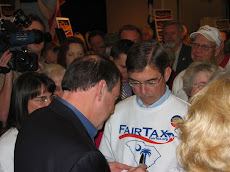 Tax Freedom Day is a significant representation because it uses the days of the year as a scale – 365 days equals the nation's income - & then pinpoints the date on the calendar commensurate with the fraction of the nation's income devoted to taxes. This year the national Deficit-Inclusive Tax Freedom Day occurs on May 7 or 127 days into the year. 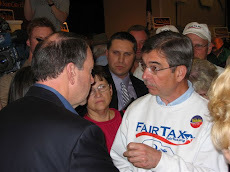 By this measure Americans will work 46 days to pay federal, state, & local individual income taxes, 26 days to pay payroll taxes, 15 days to pay sales & excise taxes, 10 days to pay corporate income taxes, 10 days to pay property taxes, 6 days to pay estate & inheritance taxes, & custom duties, & 14 days to pay for the annual federal deficit borrowing which represents future taxes owed. May 7 equates to a percentage tax burden of 34.8%. Connecticut, New Jersey, & New York (in that order) are once again the worse Tax Freedom Day states to live in. Tennessee is the second best which explains why people, like Arthur Laffer, are moving there. 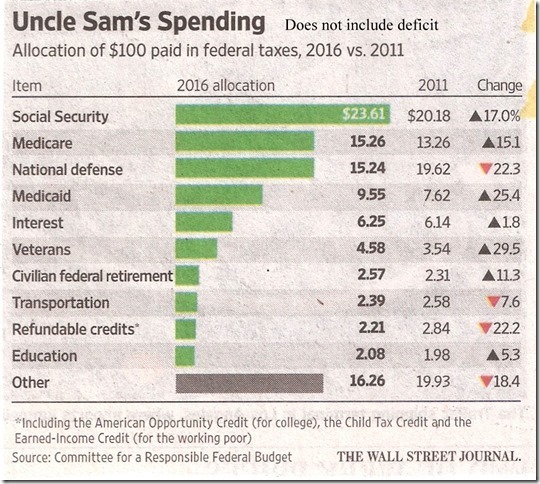 Americans will spend more on taxes in 2017 than they will on food, clothing, & housing combined. Tax Freedom Day in 1900 was January 22 when the tax burden was 5.9%. Thanks to Laura Saunders for providing the following graphic that shows where our federal tax money went in 2016 as well as the percentage change over the past five years. Please note that seven of the above categories are transfer/welfare payments that make up way more than half of federal spending. Accordingly, these claims on earned income pose a tremendous hurdle that must be overcome in order to generate wealth creation, prosperity, & substantial economic growth. If America is ever going to return to the type of vibrant growing economy that was commonplace in the second half of the 20th century we need to go back to all the principles of supply side economics (none of which has been followed for years) that fueled economic growth from 1983 until the turn of the twenty- first century: 4.8% average annual growth from 1983 to 1988 with growth effects continuing into the 1990s when a reduction in the capital gains tax rate under Gingrich occurred. Not only did we not have anything like substantial economic growth under BO the last eight years but forecasts of more years of lackluster 2% growth abound. The missing point from supply side principles, highlighted by the above graphic, is that the reduction of the size of government & its claims on earned income is what fuels economic growth when coupled with sound money policies & lower marginal tax rates for the highest income earners.